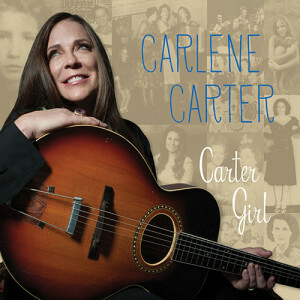 Carlene Carter’s new album Carter Girl (Rounder), a tribute to the mus-ical heritage of her fabled family, is a triumph. Legendary is a shamefully overused word, but how else to describe Carlene’s grandmother, Mother Maybelle Carter, her mother, June Carter Cash — who, with aunts Helen and Anita, were the Carter Sisters — her father, Carl Smith and her stepfather, Johnny Cash. Carlene and producer Don Was sifted through some 400 songs before settling on the 12 tracks for Carter Girl, a blending of Carter/Cash classics, songs from her own catalogue and a couple of relative obscurities. Extended family members like Willie Nelson, Kris Kristofferson, Mickey Raphael, Vince Gill and Elizabeth Cook help make the music shine as bright as the last name of the man at the mixing board, Bob Clearmountain. With rock great Jim Keltner behind the drums, “Little Black Train” kicks things off with a big bang that spins out a universe of possibilities. Carlene’s country DNA doesn’t stop her from rocking out when she wants. She honed her rock & roll chops working with Graham Parker’s band The Rumour and New Wave mastermind/then-husband Nick Lowe more than three decades ago. The first stanza of “Little Black Train” signifies that Carter Girl will confront the darkness as well as celebrate the light. There’s nothing dark in the sweet nostalgia of “Me and the Wildwood Rose,” a song Carlene wrote and recorded 25 years ago for her I Fell in Love album and reprises here. The jaunty tune and vivid lyrics capture the wonder of the hours she spent on tour with Mother Maybelle, sharing the back seat with her kid sister Rosie (aka Wildwood Rose). The irresistible “Blackie’s Gunman” tells the enjoyably confusing tale of the best “two gunman in the land” who could “shoot the ace of diamonds with a draw from either hand” and who details a love life with a girl named Nellie whom he knows he’ll never meet. As fate would have it, Johnny Cash’s 1984 album “Out Among the Stars,” released in March, features a duet with June of “Baby Ride Easy,” a song Carlene had previously recorded with Dave Edmunds on her Musical Shapes album. She adds new vocals to the duet, further proof that the Carter/Cash circle is unbroken.